The 44th D3football.com Around the Nation podcast of the calendar year is the one in which we get to talk about Stagg Bowl XLVI, the 24-16 win by Mary Hardin-Baylor, and discuss the postseason awards. In this pod we discuss, debate, and then announce the D3football.com Offensive Player of the Year, the D3football.com Defensive Player of the Year and the D3football.com Coach of the Year. It’s a live debate on the air, and the awards end up a really interesting discussion where you can hear what our priorities are for each award, and which candidates were discussed. 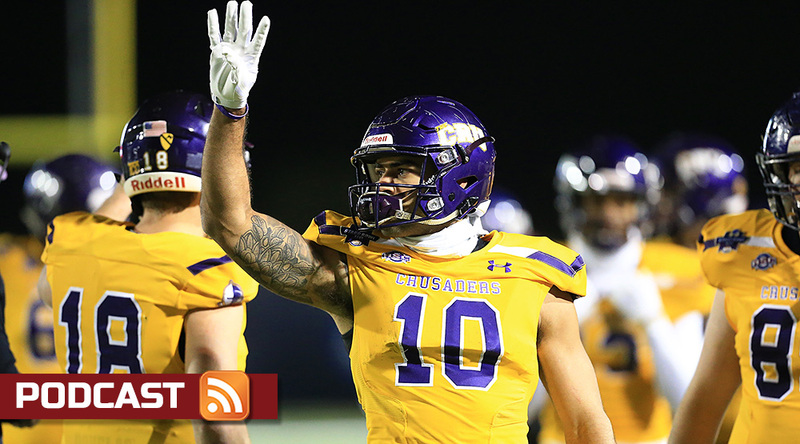 Adam Turer, Greg Thomas and Frank Rossi join Pat Coleman and Keith McMillan for this podcast, and Adam brings in an interview with Stagg Bowl Most Outstanding Player T.J. Josey, who ended up at the same wings establishment as our crew after the game. Plus, who should be No. 2, or No. 3? And what did each of us take away from the 2018 season?